Sinharaja’s rainforest canopy under the Milky Way- an unusual sight given that high humidity often prevents clear view of the heavens. (May 2017). Two successful OSC Geography field studies have come and gone in the last 15 months. Both learning experiences gave an opportunity for small groups of motivated DP1 students to investigate an individual research question in a rural Sri Lankan landscape. Sinharaja rainforest, a UNESCO-designated World Heritage site, is located the south-western “wet zone” of the country and is well known for its rich biodiversity. 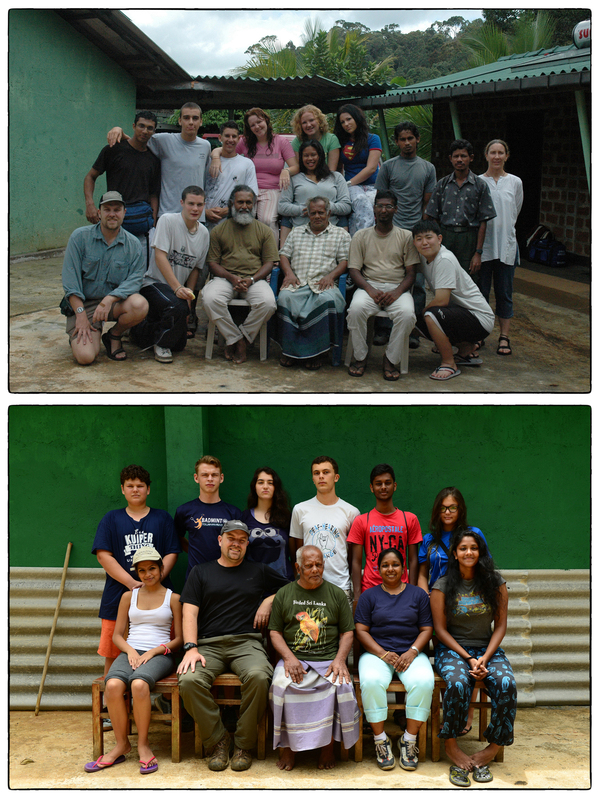 OSC classes have been conducting field work in Sinharaja since 2005. The location offers ideal conditions for student learning, inquiry and field work on socio-economic, tourist and land-use themes. Many years ago, we used to do more ecology/ecosystems studies but the changes in the DP Geography syllabus has influenced how students craft their research questions around human aspects of the landscape. On both trips we were privileged to stay at Martin’s Wijeysinghe’s Forest Lodge; it continues to offer an ideal base for student field work, with access to the protected area, a range of habitats and home gardens. The Class of 2018 geography class included eight enthusiastic students representing a diverse range of countries (eight different nationalities, with half the class being dual nationals). They embraced the learning opportunities, didn’t complain about the leeches (it was relatively dry this year) and seemed to thoroughly enjoy the Sri Lankan cuisine cooked up by Martin’s daughter. In 2017 Kamila Sahideen provided support in the interviews and was once active with finding frogs and other forest creatures. We were also happy to have Salman Siddiqui (Malaika and Maha’s father) along for one night. With his role as the head of IWMI’s GIS unit, I appreciated having Salman’s insights on how we might better use GIS/RS & drones to emphasize spatial dimensions of our data collection. The Class of 2019 geography class was slightly smaller but no less enthusiastic. There were six students and we were supported by Sandali Handagama, OSC’s multi-talented math teacher (and a former student of OSC). We hired four Sinharaja guides each day and they were essential in translating the surveys and helping the students to better understand the area. We have now developed a strong relationships and they have played a key role in the success of OSC’s field work in Sinharaja. Most of the surveys were gathered on foot but at times we hired local jeeps to take us further away from the ticket office at Kudawa. Each of the students explored an individual geographic research question but pooled all of their sub-questions into a single survey that all could run. The actual survey of 45-50 questions could take up to 20-30 minutes with introductions and a look around home garden properties. The respondents were gracious with their time and several OSC teams were invited to have tea. With several different teams going in different directions we collected 72 different interviews in 2017 and 42 in 2018. We collected responses using Survey 123 a GIS-enabled data gathering app that all the students could run off their phones (we also recorded every response on paper). This allows students to map their results and do basic spatial analysis on the findings using ArcGIS, the GIS software package that they learn to operate in my class. The elusive and rarely seen Golden Civet Cat (Paradoxurus zeylonensis) making a short visit to Martin’s Lodge during the course of our final meal of idiyappam (string hoppers) and kiri hodi (potato curry).Food was dropped in a slightly messy panic in order to trigger the camera and flashes during its brief time with us. Sri Lanka frogmouth (Batrachostomus moniliger) female on left and male on the right in a patch of tree ferns. 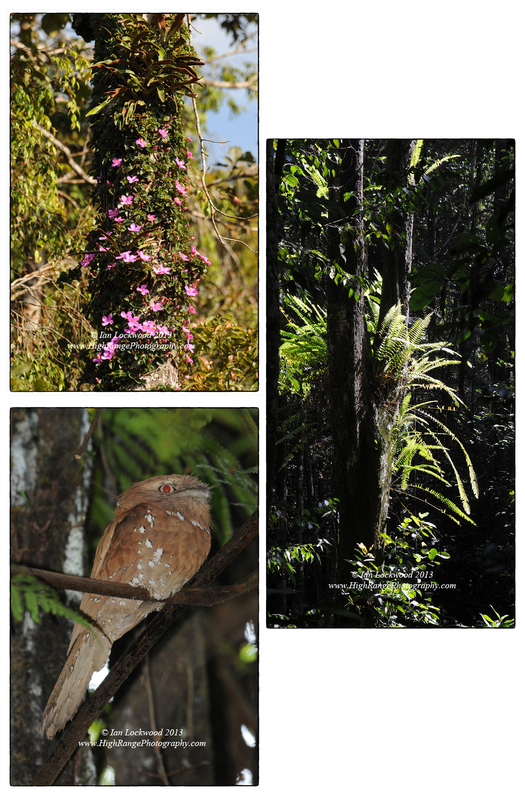 These pictures are only possible-like almost any frogmouth image-with the sharp eyes of a guide! I was assisted by Thandula, Ratnasiri and several others. Students got impressive pictures with their phones. (May 2018). 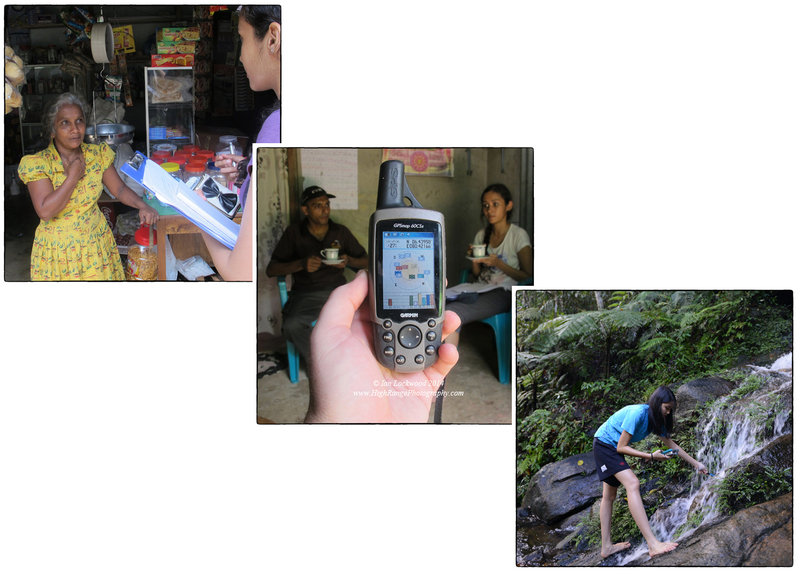 In addition to conducting the surveys, students got a flavor of being ecotourists in a tropical forest. They walked the different forest trails, encountered mixed species feeding flocks, appreciated small rainforest creatures and soaked their feet in jungle streams. Looking for frogs, insects and snakes at night is always a special treat. On the 2017 trip the class had me wake them up in the middle of the night to take in the majesty of the Milky Way in unusually clear, moisture-free skies. A highlight of the 2018 trip was having an encounter with a rare Golden Civet Cat (Paradoxurus zeylonensis) while eating dinner at Martin’s. The shy nocturnal mammal graced us for a few brief minutes and fed on bananas put out by our hosts. We completed our Sinharaja visits with a hike up to Moulawella peak to take in the full extent of the Sinharaja rainforest landscape. The views in 2017 were especially clear but 2018 also offered the team a chance to take in this remarkable rainforest and home garden landscape. OSC students walking through tea and cinnamon fields in a home garden. (May 2017). Home garden overlooking the Kudawa village valley. (May 2017). Relatively low income home garden. (May 2017). Relatively high income home garden. (May 2017). Paddy surrounded by mixed forests and home gardens. (May 2017). Class of 2018 collecting data on paper and on a phone (with Survey 123) in a home garden. Taking a walk through the rainforest at the beginning of the study. Devin and Sarah interviewing a tea farmer (and father of our guide) west of Kudawa. Home Garden with both cement and adobe partitions. Collecting data with Survey 123 loaded onto an iPhone (out of mobile signal reach). Dominic photographing a vine snake (Ahaetulla nasuta) on our way up to Martin’s on the first day. Maha interviewing a young forest guard at the ticket counter. Jordan, Lukas interviewing a forest guard with translation help from Sandali. Class of 2019 DP Geography Class and several of the Sinharaja guides (May 2018). Sri Lanka grey hornbill (Ocyceros gingalensis) at Martin’s (while we were eating breakfast). Green Pit Viper (Trimeresurus trigonocephalus) showing its tongue. Land crap on the forest floor. Günther’s golden-backed frog (Hylarana temporalis). This species has undergone taxonomic revision and I may need to update the species name once I have better information. Sri Lanka Shining Gossamerwing (Euphaea splendens) at the Koskulana River that flows through Kudawa. Sri Lanka Survey Department. Sheets 80_x & 81_x (1:10,000). Colombo: 2015. Maps & Spatial Data. Wijeyeratne, Gehan de Silva. 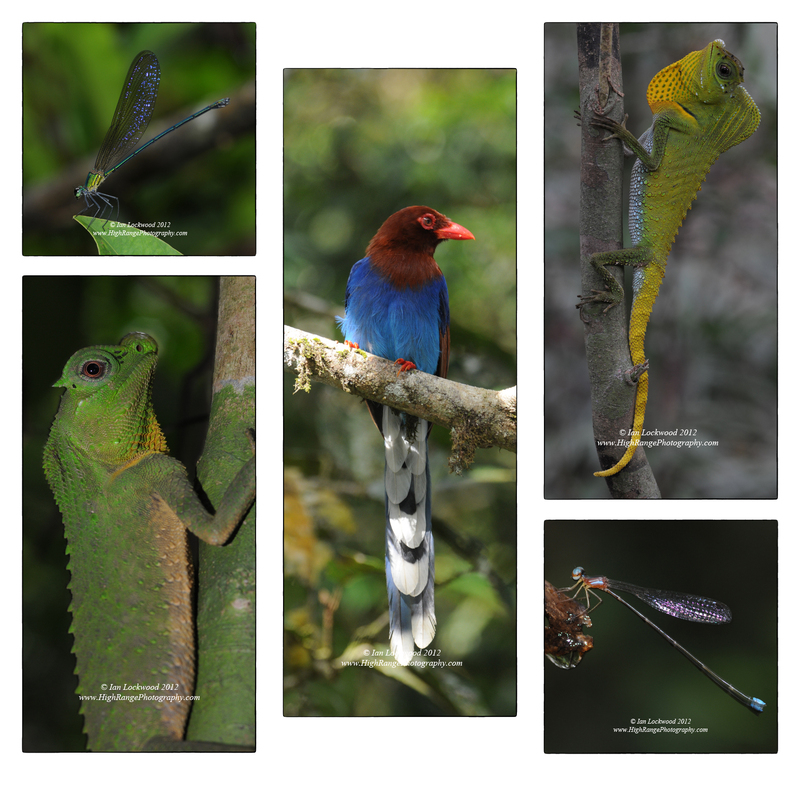 Sri Lankan Wildlife (Bradt Guides). Bucks, England: Bradt Travel Ltd. 2007. Print. As usual, Sinharaja offered many superb sightings of endemic rainforest creatures: Serendib Scops Owl (Otus thilohoffmanni) in the Sinharaja core zone, flanked by two different frogs photographed near Martin’s Lodge. Towards the end of the school year and before the South West monsoon set in OSC’s DP1 Geography class took its annual IA field study to Sinharaja rainforest. 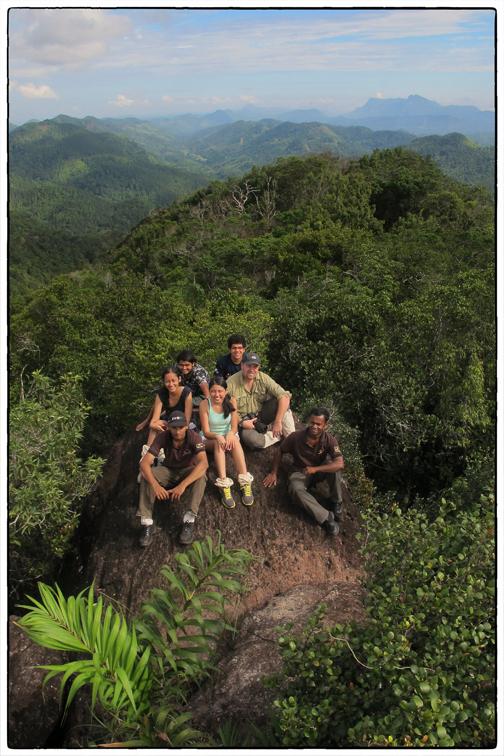 This was the 11th OSC field study at Sinharaja (the 2015 trip was our 10 year anniversary) and, like past visits, it offered an unparalleled opportunity for the students to engage in field work inside and along the edges of a protected Sri Lankan rainforest. Keeping in mind the protected area and the impressive forest area that Sinharaja hosts, my students focused on investigating questions relating to human communities on the park boundaries. Using questionnaires and 1:1 interviews with residents they explored cropping, land use, water resources and tea patterns in the study area. There were strong spatial elements in the study that were later incorporated into their reports using GIS. This year we used relatively new 1:10,000 digital vector data from the Sri Lanka Survey Department as well as the most current population and housing data from the Sri Lanka Department of Census and Statistics. Once again we stayed at Martin’s Wijeysinghe’s Jungle Lodge. Martin provided one of our first interviews, which helped set the stage for many more fruitful conversations. The Sinharaja Forest Department guides played a critical role in translating and being a bridge between our group and the local community. In many cases they took us to visit neighbors as well as their own families. We estimate that we were able to interview roughly 60% of the households in the Kudawa area. 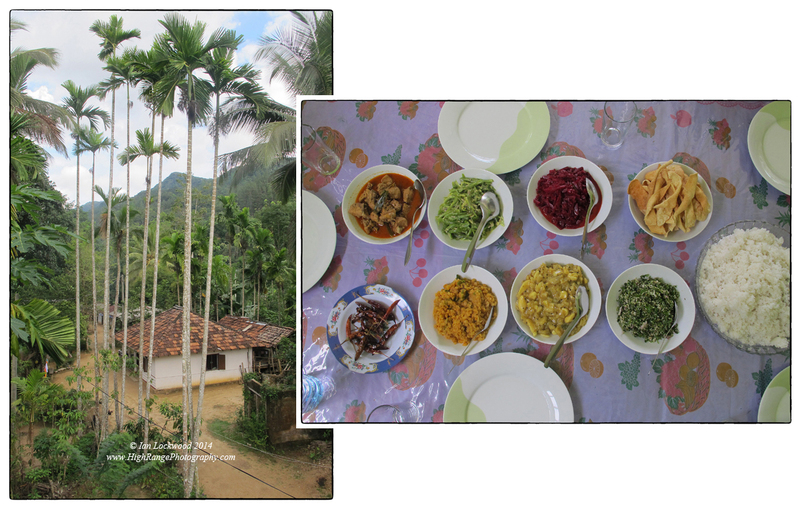 On our first full day of field work we were in the Kudaa village area and had a traditional lunch with Martin’s daughter’s family. On the second day we explored eastwards up a little used road to the family that has Sri Lanka spurfowl (Galloperdix bicalcarata) visitors every morning. We only heard the bird but the students conducted several memorable interviews that morning. Our group of students was supported by Kamilla who joined us as a female chaperone and frog locater par excellence. The field work was balanced with down time spent soaking tired feet in the nearby stream and climbing Moulawella on the final day. On our way out we had the good fortune to see a rare Serendib Scops Owl (Otus thilohoffmanni) in a fern thicket. By that time the students had been inundated with views of rare birds, frogs, snakes but I hope that one day they’ll look back and realize what a special final sighting this was! Interviewing Martin’s Wijeysinghe as part of the Geography IA study. 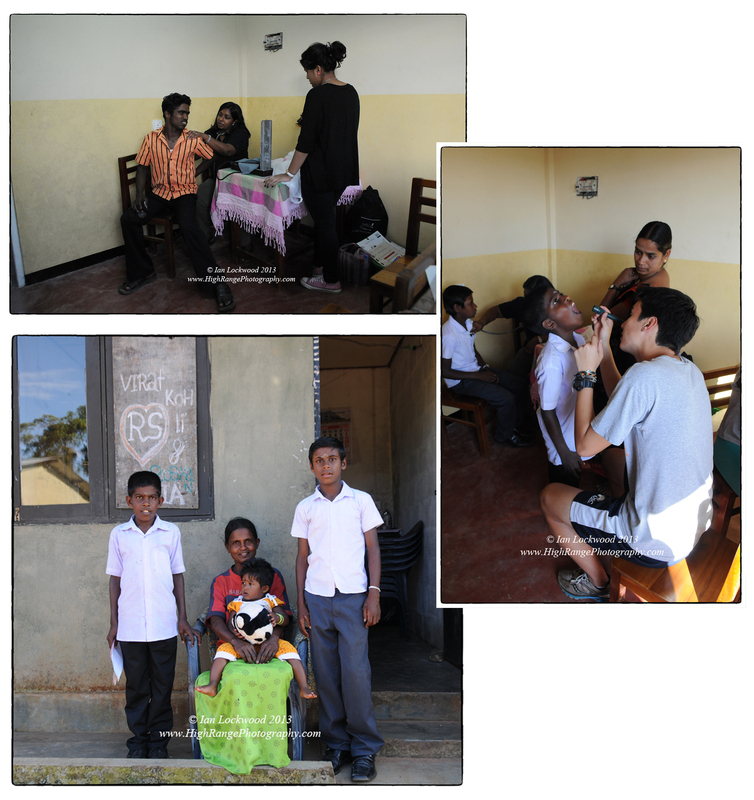 Snapshots from the field work in and around Sinharaja’s north western Kudawa entrance. The poster, now out of print, decorates the common area at Martin’s lodge. Students broke into two different groups so that we could maximize the interviews and responses that we collected. I had the opportunity to spend time with both groups as we covered different areas near Kudawa village. One of the memorable interview and conversations that we had was with a family that grew tea, cinnamon and various fruit in their home garden. We were welcomed into their home and were able to observe the process of cinnamon bark stripping. Just before we left they offered a freshly cut pineapple from their garden. Miscellaneous snapshots from the Sinharaja rainforest area. View looking north-west from Moulawella peak. On the final day we do a hike up to this point to give the class an appreciation for the Sinharaja area and the effort that has been made to protect its spectacular rainforests. Sinharaja’s guides play a key role in any visitor’s experience in the rainforest. They are knowledgeable, hard working and patient with their clients. OSC enjoys a warm relationship with their team and we have enjoyed getting to know more about the rainforest and their communities through the guides. I was able to take this picture of most of them on one of our first days before people had arrived at the Kudawa ticket entrance. OSC’s Class of 2017 DP Geography students with Martin Wijeysinghe, their teacher (the author) and Kamilla. 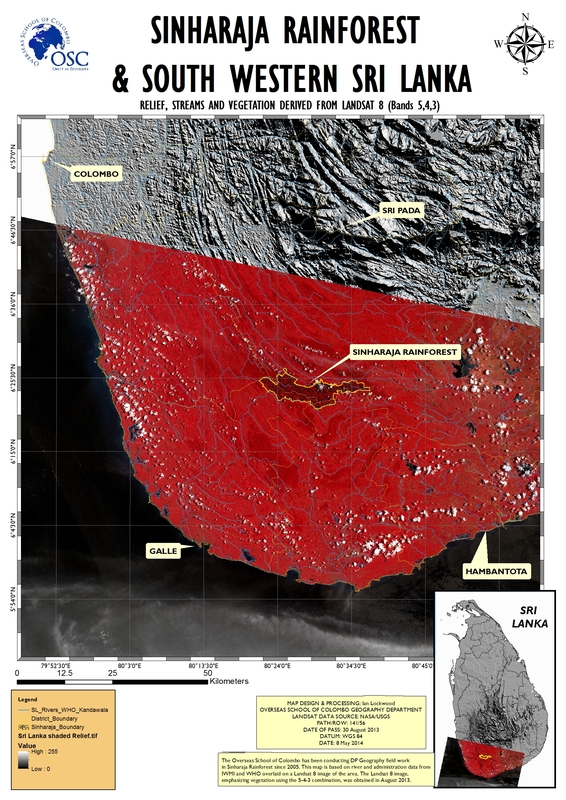 OSC’s field study site in Sinharaja: a map created with ARCGIS 10.4 and recently released 1:10,000 data from the Sri Lankan Survey Department. Malabar trogon (Harpactes fasciatus), male and female, photographed in the Sairandhri zone of Silent Valley National Park. This is one of the most beautiful birds from the Western Ghats & Sri Lanka hotspot and is found in many parts of the Ghats as well as in most evergreen forests (both wet and dry) in Sri Lanka. It is quite shy but can be photographed with patience. In Sinharaja rainforest Malabar trogons are often found in the mixed-species feeding flocks that are a key feature. 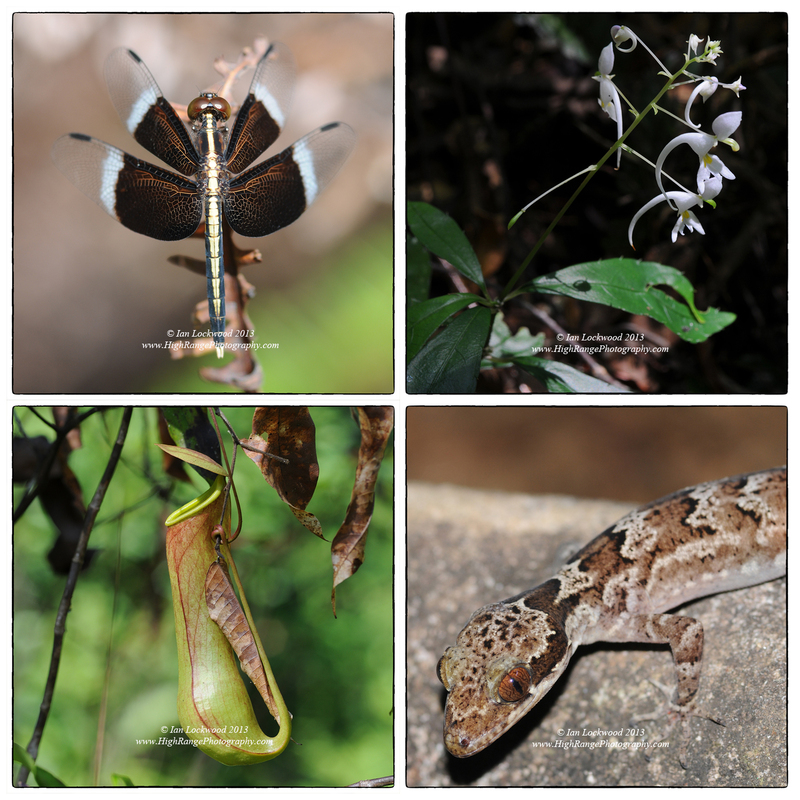 Some of my best sightings are from Sinharaja trails and it was thrilling to have the long encounter in SVNP with Aneesh CR that produced these images. The Western Ghats and Sri Lanka biodiversity hotspot encompasses a swathe of area running down the western coast of India across the Palk Straits to Sri Lanka and its southernmost point at Dondra Head. The heterogeneous landscape-composed of rugged hills, river valleys, wetlands and coastal plains there host a variety of vegetation types. Being a hotspot, there are unfortunately anthropocentric pressures: dense human populations, mining, damming, plantation agriculture and expanding human settlements to name a few. There is also impressive work that has been done in protecting key parts of the hotspot. A significant type of vegetation is the tropical wet evergreen forest that are found in high rainfall areas along the hotspot. This blog is a personal narrative exploring two exemplary tropical rainforest habitats in the Western Ghats and Sri Lanka biodiversity hotspot-Silent Valley in the Indian sate of Kerala and Sinharaja in south-western Sri Lanka. By good fortune our school had two breaks over a course of March/April this year that allowed me the opportunity to explore both of these seminal protected areas with our two children. Amy-eight years old and enthusiastic about learning, art and sports -accompanied me to Sinharaja in March. Lenny, in middle school and now approaching his teen years is involved in theater productions and has a sharp eye for the wildlife in our Malabe neighborhood. He joined me on the Silent Valley exploration in April. The rare Serendib Scops Owl (Otus thilohoffmanni) photographed at a day-time roost in Sinharaja captured in in a beam of afternoon light with the able guidance of Thandula. The species was only identified 12 years ago by Sri Lankan ornithologist Deepal Warakagoda. This map shows the location of Silent Valley and Sinharaja layered over an updated SRTM “Swiss shade” model that I have just started to work with. The Western Ghats boundary (from ATREE) and the major protected areas in both Sri Lanka and the southern Western Ghats are also highlighted. Table 1: Comparing the two protected areas. Silent Valley sits high amongst India’s most important protected areas. Not only does it preserve one of the largest tracts of undisturbed tropical rainforest in the Western Ghats, it is a symbol for a people’s movement to protect wilderness areas from misguided “development.” In the 1970s a plan to dam the Kunthipuzha River that runs from the Nilgiri plateau to the Arabian Sea galvanized a people’s anti-dam movement in Kerala in favor of protecting the forest. It was not an easy fight – in addition to agitation from citizen’s groups in Kerala, luminaries such as Salam Ali and the strong will of Indira Gandhi played a key role in Silent Valley’s notification as a national park in 1985. The area is now zealously protected and is one of the finest tracts of rainforests in the Western Ghats. Shekar Dattatri’s 1991 film Silent Valley: An Indian Rainforest helped introduce many of us to the area. His article (listed below) presents a timeline of events that led to the area’s protection. During the longer Sinhala & Tamil new year break this year Lenny and I journeyed to south India and Silent Valley for an exhilarating four day visit. We were the guests of Silpa Kumar, the wildlife warden of SVNP who Lenny and I met a year and a half ago in Kerala’s other national park, Eravikulam. I was interested in revisiting SVNP (22 years ago I made a very brief foray into the forest) and I also wanted to introduce Lenny to the wonders of a Western Ghats rainforest. This was hard work-his friends were going to amusement parks in Singapore or beach resorts in the Maldives and Lenny was going on another adventure with his father. With a few incentives, he was a good camper and played a vital role in helping to spot birds and mamals. Of course, it’s some way from Colombo to the Kerala side of the Nilgiri Hills. Silent Valley sits in the south-west portion in a relatively inaccessible part of the greater Nilgiri Biosphere Reserve. Our journey took us to Madurai, the Palani Hills and then on across the scorching hot and bone-dry Palghat Gap to Mananarkad, the nearest large settlement to the Valley. We were warmly received by Silpa and set up for an amazing visit. That afternoon we journeyed to the Mukali gate and then into the core zone in a forest department jeep. We spent the next three days based around the old proposed dam site at Sairandhri. A young and energetic officer/Wildlife of India Institute graduate Aneesh accompanied us and helped us learn more about the area. On one of our full days we walked the trail to the Poochipara forest station. It crosses the Kunthipuzha and then continues through gorgeous, towering rainforest to a forest guard hut. Back in the Sairandhri vicinity I was able to record rare and colorful creatures-most that I had seen in past years but was never able to photograph properly. Highlights included sightings of Malabar Trogons, Southern Treepies, White Bellied Blue Flycatchers, Fairy Bluebirds, Gray Headed Bulbuls, Great Pied Hornbills, Lion Tailed Macaques, Nilgiri Langurs, Draco lizards and much more. We shared the forest guesthouse with Aneesh and three young women from the College of Forestry in Trissur Kerala. They were conducting population studies of bats, rodents and small carnivores. Lenny was able to observe them setting up mist nets and catching bats. Ever the prankster, Lenny photo-bombed one of Devika’s camera trap-a device that a few weeks earlier had captured a tiger and black panther (a melanic form of the leopard) moving on different nights. There have been significant changes in Silent Valley since it started receiving formal protection from the Kerala Forest Department. One change and improvement that is visibly obvious is the increased forest cover. The image on left was taken in January 1995 during a fleeting day-long visit that I did. The right image was taken from roughly the same place this month (April 2016). Though the lighting is not great, several of the patches of grasslands have now been taken over by forest cover. This, of course, poses interesting challenges as there is less fodder for large herbivores- and SVNP’s wildlife staff reported decline in gaur and Sambhar. The tree growth is of native vegetation and appears to be following the somewhat predictable stages of ecological succession that one would expect in this area. 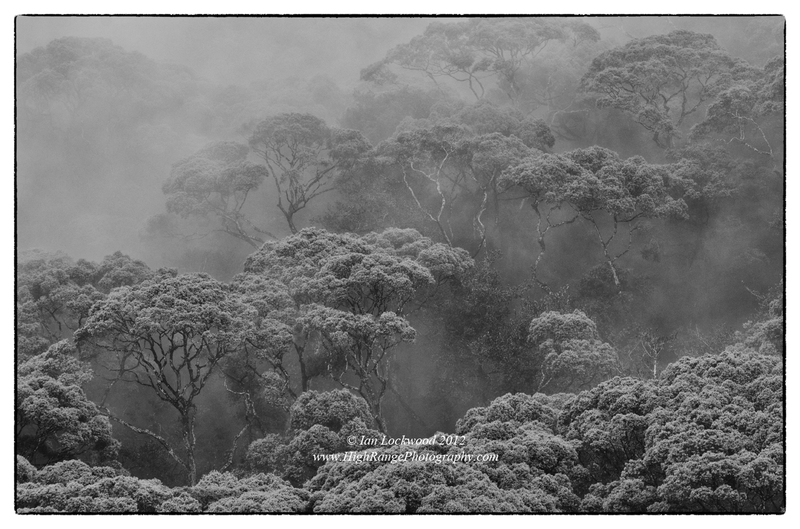 Canopy of the rainforest in Silent Valley National park -a composite exploration. Lenny’s Lion Tailed Macaque (Macaca silenus). While having a short siesta Lenny and I were alerted to a troop of LTMs next to the rest house. This male was also in a lethargic mood in the afternoon heat. LTMs are significant keystone species in the rainforests of the Western Ghats. Their protection was a key issue in the debate about whether or not to dam the Kunthipuzha River and flood prime LTM rainforest habitat. White Cheeked Barbet (Psilopogon viridis) and Fairy Blue bird male (Irena puella) at Silent Valley National Park. The barbet is endemic to the Western Ghats while the Fairy Bluebird is distributed in the Western Ghats (but not Sri Lanka) and into NE India and SE Asia. Sri Lankan endemic bird species from Sinharaja, taken in a similar habitat to the SVNP birds above. From left to right: Yellow Fronted Barbet (Psilopogon flavifrons) Ashy Headed Laughing Thrush (Garrulax cinereifrons) and Layrd’s Parakeet (Psittacula calthrapae). 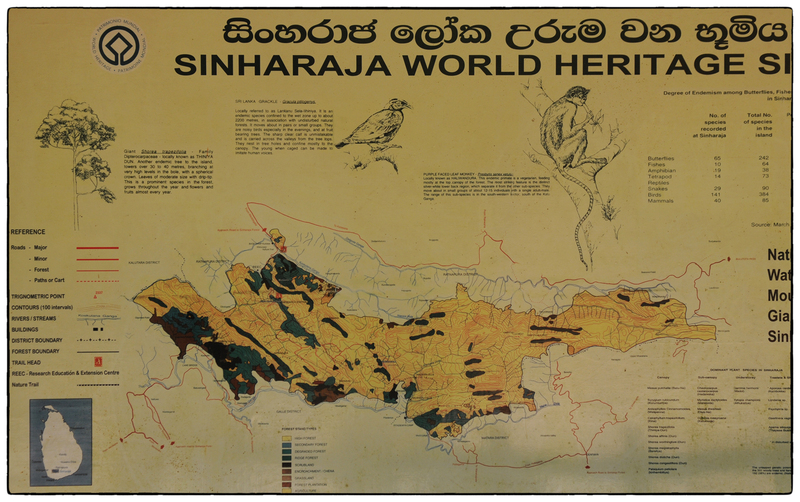 Like Silent Valley, Sinharaja’s status as a protected area was born from controversy. The area that makes up what visitors know of the park was part of a larger belt of lowland rainforest in the Rakwana Hills. The lore associated with the forest stretches back to a time before recorded history. Much of this hilly area was converted into plantation agriculture in the 20th Century but Sinharaja enjoyed natural protection because of the rugged topography of its boundaries. However, in the 1960s roads were built into its heart and mechanical logging was started to feed a large paper mill located in Avisawella. It was a time when this sort of project elicited praise for improving the prospect for “development.” Awareness about ecological matters-concepts like biodiversity, deforestation, ecosystem services and watershed management were not in the public discourse of the age. As the name suggests, Sinharaja (“lion king”) evokes pride in the Sinhalese and by the 1970s groups of citizens, university professors and students had started to raise awareness about the deforestation and need to protect the forest. The March for Conservation group was a key actor in raising public awareness. It took Julius Jayewardene’s 1977 election for that to happen. 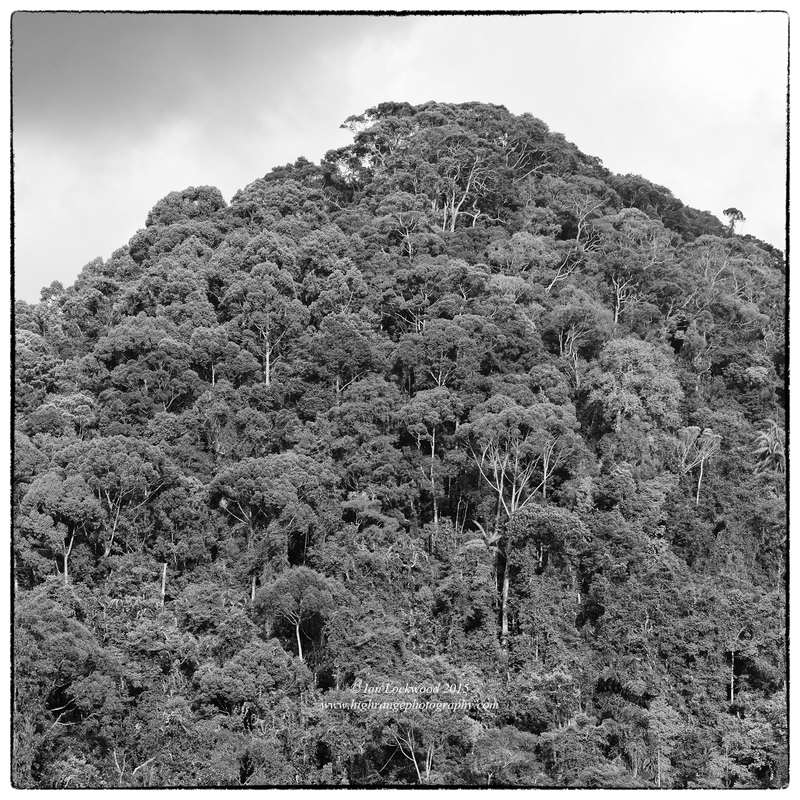 The logging soon stopped and Sinharaja was protected first as a sanctuary in 1978 and then as a UNESCO-designated World Heritage site in 1988. Since then it has become one of the most studied rainforests in Asia. The area that was once logged has made a remarkable recovery and Sinharaja illustrates the potential for rainforest recovery after human disturbance. In March I did a short three-day visit to Sinharaja with our daughter Amy. The goal was to experience the forest and see and photograph as many birds (and other creatures) as possible. In recent years most of my visits have been with students as part of our DP Geography field work and it was good to have an opportunity to explore other places in the area for personal reasons. It was quite hot and dry- in fact dry enough that there were no leeches! Amy and I were lucky to have Thandula as our guide on this visit. We walked to the research center, observed a few mixed species flocks and journeyed to see a Green-billed Coucal (Centropus chlororhynchos) next and the rare Sri Lanka Spurfowl (Galloperdix bicalcarata). Many of the birds were busy nesting but the migrants (paradise flycatchers etc.) were still around, which we appreciated. The highlight was a superb encounter with the Serendib Scops Owl (Otus thilohoffmanni), a bird brought to public notice by Deepal Warakagoda in 1998. Thandula had worked in Sinharaja with Deepal and it was thanks to him that we saw this shy bird. As usual, we stayed at Martin’s where we are treated like family and Amy was showered with special attention. Her favorite part was spending time exploring the stream below Martin’s. There are fascinating parallels in Sinharaja and Silent Valley that are worth highlighting briefly here. Both have conservation histories that started in controversy, elicited a ground swelling of public support and resulted in their protection. From my perspective, both demonstrate effective management strategies. Silent Valley is blessed with a team of enthusiastic and committed personnel that love what they do. This stretches from the top level -who are more often in the field than office- to the forest guards manning remote posts. The Kerala Wildlife Department runs a tight operation and I was impressed by the commitment and love for their rainforest that they espoused. In Sinharaja. a similar pride in the protected area is evident in the forest guides that take tourists along trails at the Kudawa and Deniaya entrances. Their livelihoods are closely connected to the protected forest. Ecological succession is happening in both places and the recovery of the rainforest is remarkable. There have been important studies conducted on this recovery as well as other aspects of the forest areas but there are opportunities to delve deeper. Both case studies demonstrate the power of protecting South Asian rainforests for ecological, aesthetic and even economic reasons. Bawa, Kamal, Arundathi Das and Jagdish Krishnaswamy. 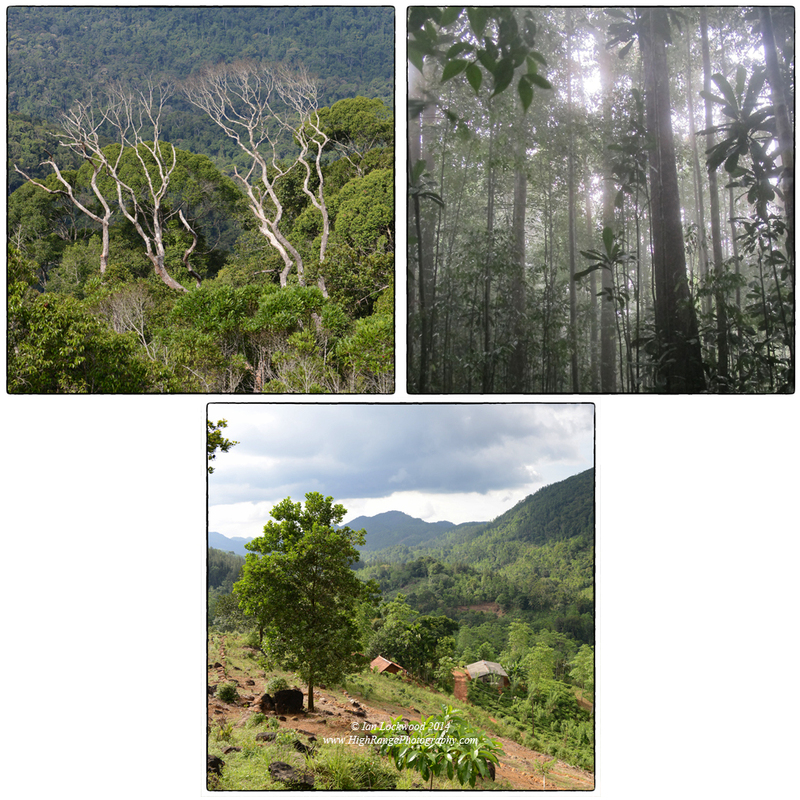 Ecosystem Profile: Western Ghats & Sri Lanka Biodiversity Hotspot. Critical Ecosystem Partnership Fund, May 2007. Web. Dattatri , Shekar. “Silent Valley – A People’s Movement That Saved A Forest.” Conservation India. 25 September 2015. Web. de Zoysa, Neela Ryhana Raheem. Sinharaja, a rain forest in Sri Lanka. Colombo: March for Conservation, 1990. Print. Louve, Richard. Last Child in the Woods: Saving our Children from Nature Deficit Disorder. Chapel Hill, Algonquin Books, 2005. Print. Manoharan, T.M. Silent Valley: Whispers of Reason. Thiruvanthapuram: Kerala Forest Department & KFRI, 1999. Print. Ramachandran, K.K. Ecology and Population Dynamics of Endangered Primates in Silent Valley National Park. Trissur: Kerala Forest Research Institute, March 1988. Web. Western Ghats Biodiversity Portal (Beta). Web. WWF Ecoregions. Southwestern Ghats Moist Forests and Sri Lanka Web. WWF Ecoregions. Sri Lankan Moist Forests. Web. Silent Valley and lower Mukurthy National Parks as seen in a a 2014 Landsat 8 image of the area. Double click for a larger 150 DPI A3 image. Postscript: Getting the child into the woods: (Left) Lenny and Ian returning from a hike to Poochipara in Silent Valley National Park (April 2016). (Right) Amy and her dad in Sinharaja photographing the elusive Serendib Scops Owl with a 600mm lens (March 2016). Left photograph courtesy of Aneesh , right photograph courtesy Thandula. Primary forest near the north-western entrance to Sinharaja. 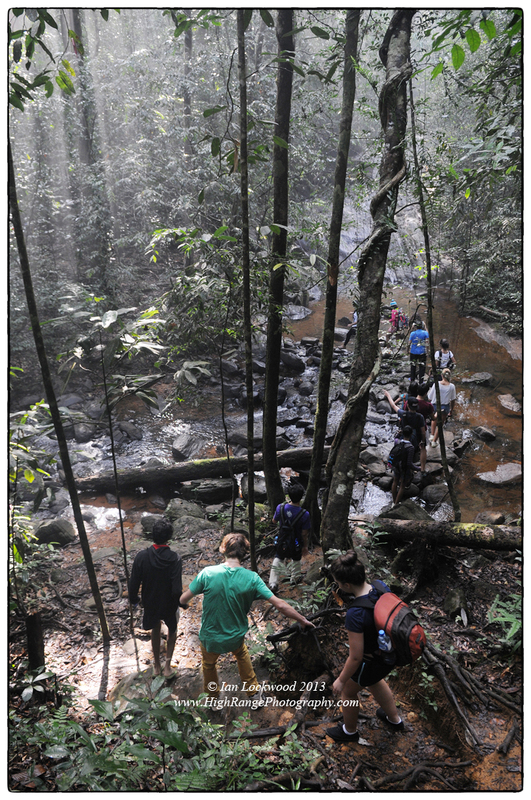 Two weeks ago OSC’s IB Diploma Geography class spent four days conducting field research in Sinharaja rainforest. This UNESCO-designated World Heritage Site located the south-western wet zone of the country is well known for its rich biodiversity. This was a significant trip -not only for the eight students and their two teachers- but for the 57 year-old school. 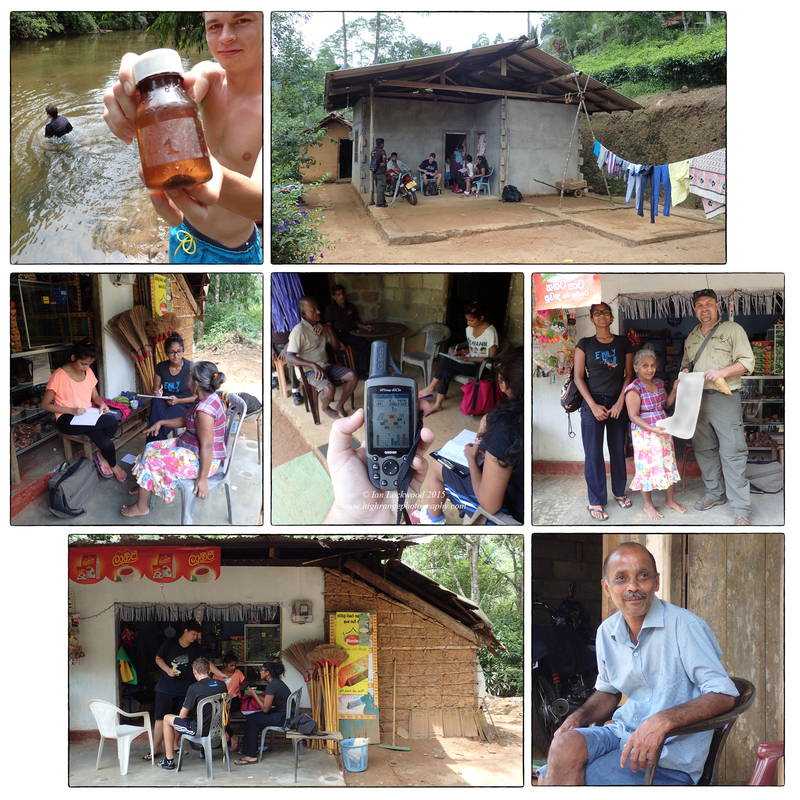 This is the 10th anniversary of OSC geography field work in Sinharaja -a location that offers ideal conditions for student learning, inquiry and field work. I had first visited Sinharaja in 2000 on a birding trip with my cousin Anna. It seemed like a natural choice of locations when I was asked to design the DP Geography Internal assessment (requiring field work) when I was hired to teach at OSC. When we first started taking students to Sinharaja in 2005 we did so under the guidance of the Field Ornithology Group of Sri Lanka and their intrepid leader Professor Sarath Kotagama. Professor Kotagama, as well as dragonfly expert (and OSC parent) Karen Conniff, helped guide the original group of geography students. The focus of the early years’ field work was on ecosystems and biodiversity. This changed when the IB syllabus was revised and we transitioned to socio-economic, tourist and land-use studies. We’ve been privileged to stay at Martin’s Wijeysinghe’s Jungle Lodge during all this time. It continues to offer an ideal base for student field work, with access to the protected area, a range of habitats and home gardens. Tropical Rainforest Biodiversity in a “Biodiversity Hotspot.” Sinharaja is know as an exemplar lowland rainforest with very high levels of terrestrial diversity. 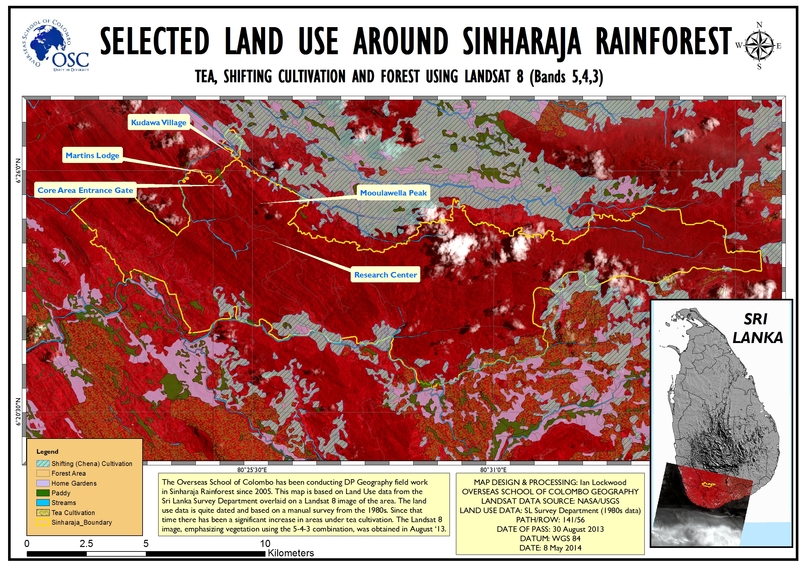 Studies by notable academics at Peradeniya University, the University of Colombo and the Yale School of Forestry have documented and tracked plant diversity within Sinharaja. Others have studied the avian, amphibian, reptile and mammalian fauna. 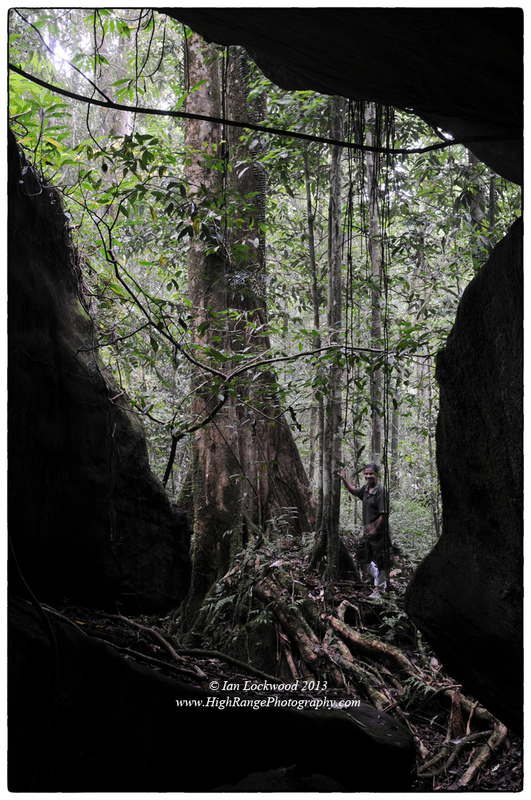 Professor Kotagama thinks that few other single forests have been as well documented as Sinharaja. Put together this provides a wealth of baseline data and information for any studies of the area. Natural recovery of cleared forest areas: It was only 40 years ago that the area that is now well-trodden by ecotourists was being systematically destroyed as a part of a large-scale mechanical logging operation. 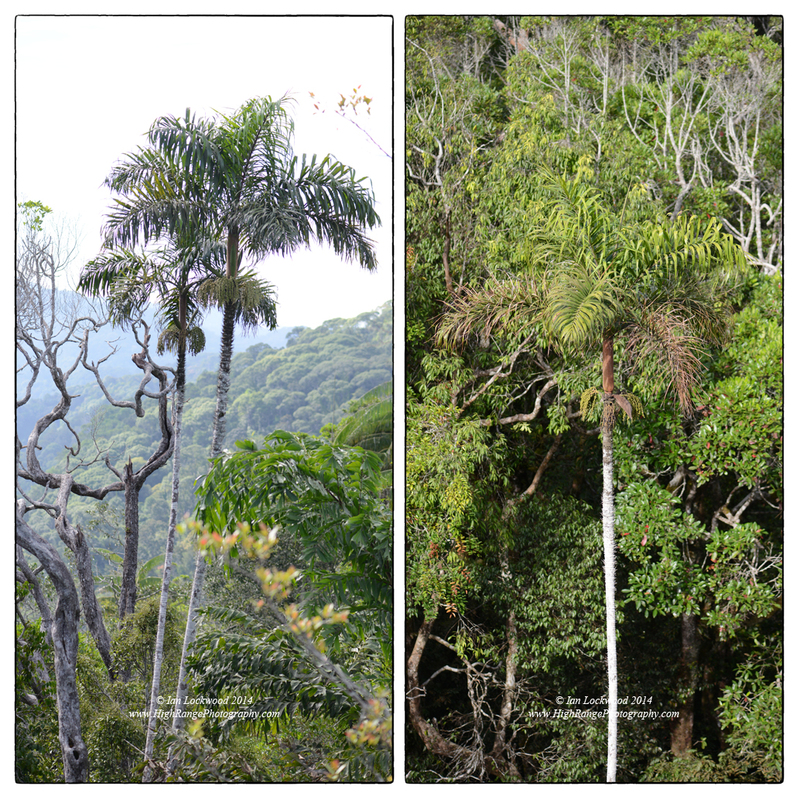 Paradigms and attitudes about tropical forests have radically changed and today the same area has been allowed to recover. The recovery of the once logged areas is, frankly, mind-blowing! There is no perceptible evidence of the logging operations in Sinharaja today. It is a remarkable case study in tropical forest recovery with very little active attempts to restore the habitat. In recent years the Forest Department has been successfully working to thin pine plantations and restore native lowland rainforest species. A model case study of ecotourism: Without intentionally trying, Sinharaja offers some of the most authentic opportunities for ecotourism in South Asia. The design of activities (walking, bird watching etc. ), the low-impact accommodation and clear, benefit to the local community (through guiding and locally owned accommodation) help contribute to this. Sinharaja’s Kudawa gate on the north-west border is its most popular entry point. OSC students have been able to track numbers of visitors in the last 5-10 years and seen a steady growth of visitors. The calendar year has key high seasons with the winter (December to February) being the peak for visitor numbers. There are at least 3-4 times as many Sri Lankan visitors as foreigners, but because of ticket prices foreign visitors contribute more to the revenue. While some visitors are naturalists and bird-watchers most foreigners are curious beach revelers taking a day to explore a rainforest within reach of the coastal resorts. Land use in the buffer and border areas of the protected area. The areas surrounding the PA boundary of Sinharaja highlight challenges to conservation. Many of these areas were only cleared for agriculture in the last 50-100 years. The dominant land use type is of home gardens (small land holding with a diverse range of fruit, vegetable and plantation species that are largely used for subsistence). Tea is now the most preferred crop in many of the Sinharaja border areas. Unlike the high-grown tea, the tea in the Rakwana Hills is cultivated in small holdings (1-2 acres) by individual households (rather than large estates with their own labor, factories etc.). To better understand the cropping patterns we have been using 1:50,000 land use data from the Sri Lanka Survey Department in our GIS mapping of the area. This data is dated and we hope to acquire more up-to-date land use data to better understand trends in agriculture and land use. Socio-economic studies of communities living on the edge of Sinharaja: OSC students have been able to conduct basics socio-economic surveys of communities living in the shadow of Sinharaja’s north-western border. DP Geography students have focused on energy choices, education, ecological footprints, housing and nutrition (for the first time this year). The Class of 2016 geography class was a stellar group to take to Sinharaja. They embraced the learning opportunities, didn’t complain about the leeches, lack of cell phone connectivity and seemed to thoroughly enjoy the Sri Lankan cuisine cooked up by Martin’s daughter. Each of them explored an individual research question with the Sinhala speakers working overtime to help others with the translations of survey questions. Once again the Sinharaja guides were essential in helping us to better understand the area. They are a key bridge to the surrounding communities. Dr. Indrika Senaratna provided support in the interviews and fully took part in all aspects of the study. We look forward to many more years of OSC field work Sinharaja. OSC in Sinharaja. Above: Class of 2006 with Martin, Professor Kotagama, Chaminda Ratnayake,Karen Coniff and others (taken October 2005). Below: Class of 2016 with Martin, Dr. Indrika and their teacher (taken May 2015). 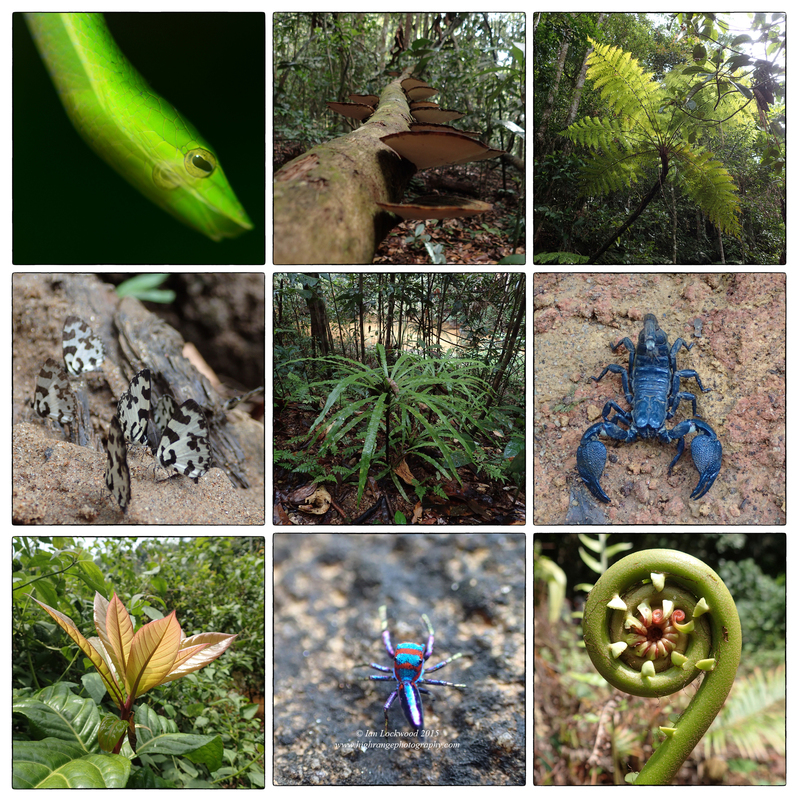 A cacophony of diversity: Snapshots of Sinharaja’s flora & fauna from the May 2014 IA field study. Class of 2016 field work in households, home gardens and shops on the Sinharaja boundary. OSC study site in Sinharaja elevation map using the (relatively) new 30 m SRTM from USGS/NASA. Click on the image for an A3 150 dpi version. Ishwaran, Natarajan and Walter Erdelen. 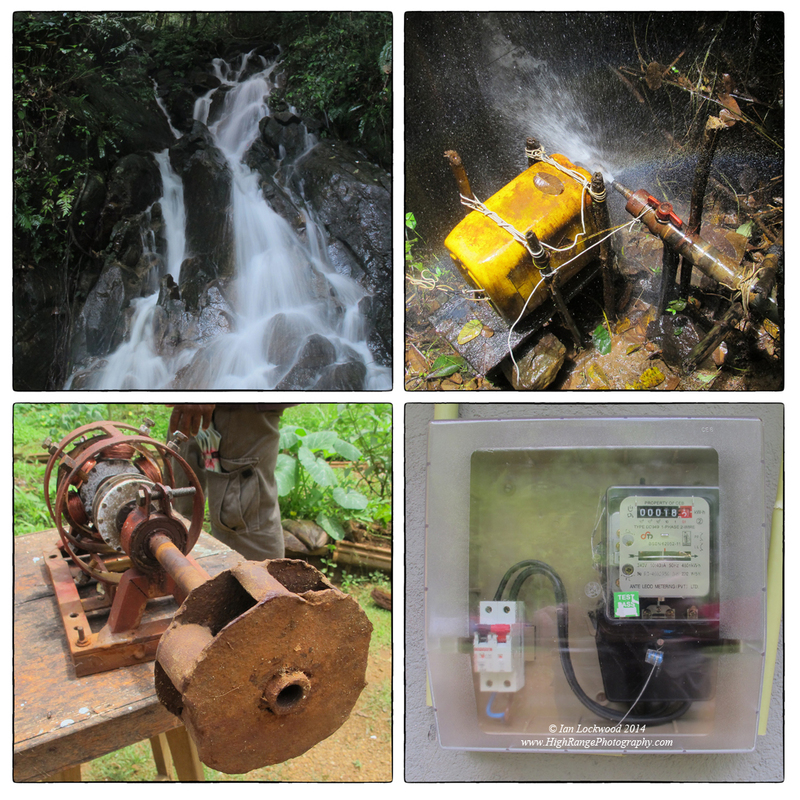 “Conserving Sinharaja: An Experiment in Sustainable Development in Sri Lanka.” Ambio. Vol. 19, No. 5. August 1990. Web. Sri Lanka’s Sinharaja rainforest has gained significant attention in the past few decades for its biodiversity and large protected area of forest in a densely populated corner of the island nation. It remains a veritable oasis of the lowland tropical rainforest vegetation that once covered much larger areas of the island’s “wet-zone.” I’ve been fortunate to be able to take student groups to Sinharaja over the past seven years and have also enjoyed several personal visits. The field study trips are usually oriented around the IB Diploma Geography Internal Assessment that requires field-work. Increasingly we have been looking to study human-ecosystem relationships and interactions (with the aid of GIS and spatial data of the area) around the popular Kudawa entrance. However, there is much more to Sinharaja that few visitors see. and on a recent trip a group of friends and I had a chance to make a long traverse over little-used paths that connect the two major entrances. This August group of friends and I had a chance to make the long traverse over little-used paths that connect the two major entrances of Sinharaja. We started in the west at the Kudawa entrance and ended in the eastern portions that my family and I had visited in May. Together with friends at the Rainforest Ecolodge we were looking to see if a day-long trek from the Kudawa entrance to the Pitadeniya exit was a feasible option to take a student group. We did the trek via Sinhagala, the “lion rock” that is a significant point at the center of Sinharaja. Though few people actually visit it, the peak has significant cultural importance and is associated with stories of the advent of the Sinhalese people. Sinhagala is roughly 17 km from the core-zone entrance above Kudawa while on the map it is a shorter 10 km to Pitadeniya from the summit. Our team was composed of four friends and faculty members from the Overseas School of Colombo. As per park rules, we hired a guide to take us to Sinhagala peak (he returned after leaving us at the peak). Meanwhile our friend Krishan from the Rainforest Ecolodge organized a team to come up and rendezvous with us at Sinhagala. 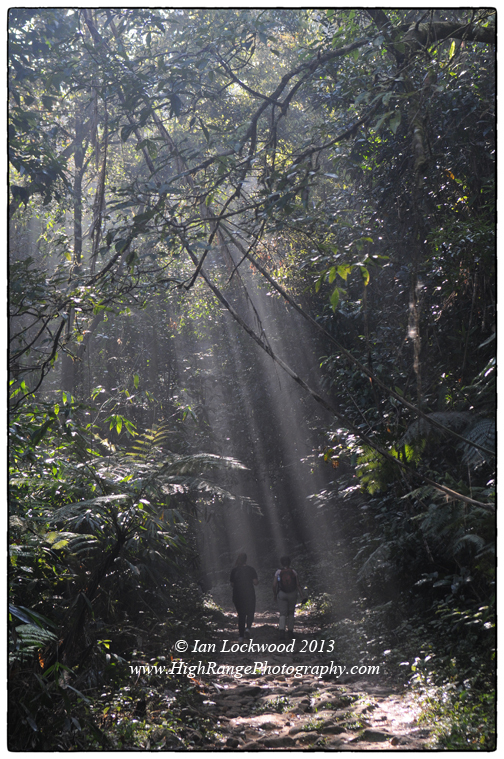 The path to Sinhagala is arguably one of the most beautiful rainforest walks that you can do in South Asia. The trail follows a long overgrown logging road that snakes into the heart of the reserve and exposes you to amazing swathes of primary and secondary forest. The walking is not challenging from the perspective of physical terrain and the altitude gain is less than 300 meters. However, the path does take time and for this reason most visitors to Sinharaja are reluctant to invest 8-9 hours of walking round trip to see it. If you are interested in stopping to watch bird flocks and look for snakes, lizards and other interesting creatures the walk can be frustrating since there is little time to indulge in such delights. Most of the bridges and culverts have been washed out and it is difficult to imagine that 35 years ago large trucks were using the same pathways to decimate the timber of Sinharaja! Now the machinery is long gone and the forest has made a startling recovery such that most people can not distinguish between unlogged primary forest and tracts of secondary forest that had once been clear cut. In fact this is really the beauty of the Sinharaja story: the protection and restoration of a tropical rainforest through the efforts of citizens and scientists who helped raise awareness at a time when “rainforests” and “biodiversity” were not in the public’s vocabulary. In the 1970s forest was simply another commodity to be commercially exploited. The tireless work of those individuals and civil society groups is now something that we visitors benefit from. 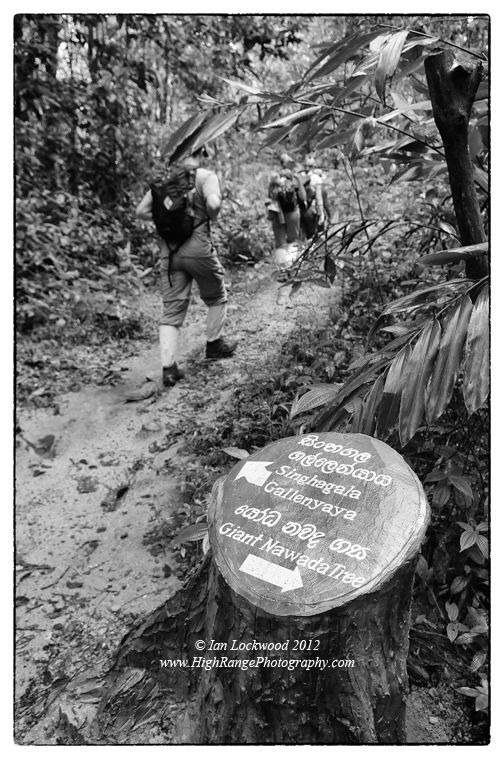 Leaving the tourist zone and heading into less trodden areas of the forest on the Sinhagala trail. 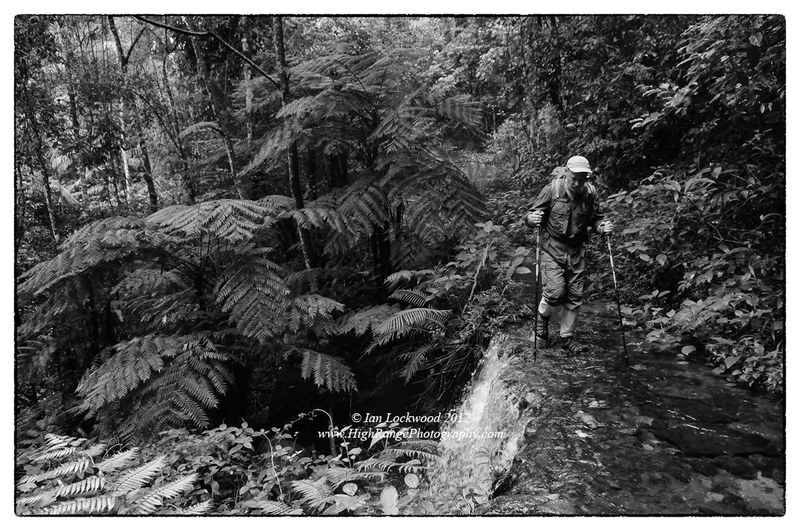 Tim Getter crossing a stream flooding over the remains of a logging road on the Sinhagala trail. After a breakfast and tea at Martin’s Forest Lodge we set off at a good pace and were the first visitors into the tourist zone. The forest was waking up after a night of nearly continuous rain, but he day was to be free of serious precipitation. In the distance we could hear the sounds of mixed species flocks and the dull echoing, reverberations of the endemic Purple Faced Langurs (Trachypithecus vetulus). A Sri Lankan Jungle Fowl (Gallus lafayetii) strutted across the road unconcerned by our presence- I think every visitor see (and probably feeds) the same bird. We heard the distinct wind up sounds of the more elusive Sri Lanka Spur Fowl (Galloperdix bicalcarata). This is an area that I usually walk through slowly in order to observe and appreciate lesser life forms. However, we had a long path to traverse and made fast time in this more easily accessible area. At the research center (a place that once hosted the workshop for the mechanized logging operations) the trail thins and it is clear that the Sinhagala trail is a different sort of route. The path was overgrown with tree ferns, shrubs and pioneer tree species competing to take advantage of the break in the canopy. Every so often fallen giants of trees created barriers that we negotiated around, under or through. The leaches very plentiful but the Kudawa leech socks allowed us to focus on more interesting creatures. Occasionally I would catch glimpses of frogs hopping away from the pathway. Giant Wood Spiders (Nephia maculata) were numerous as were the large millipedes (Spirotripetus sp.). 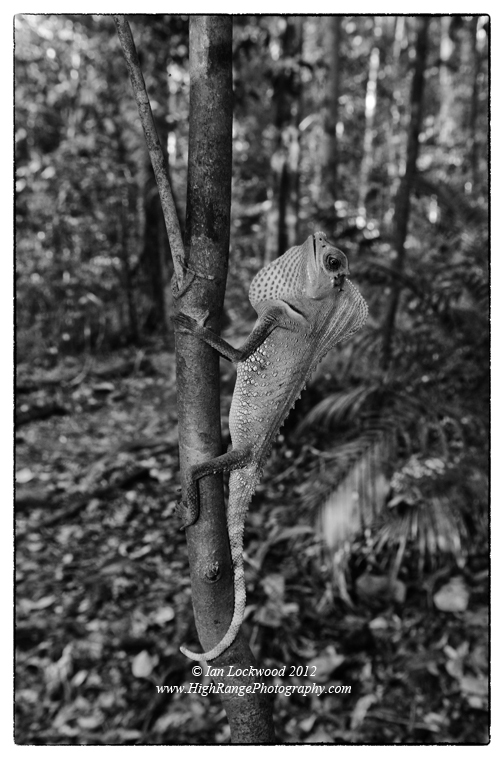 We saw a third Sri Lanka Hump Nosed Lizard (Lyriocephalus scutatus) but did not spend time with it as we had with the male and female that we had seen in the tourist zone the day before (see photographs below). Enormous growths of pitcher plants (Nepethnes distillatoria) covered what were once ugly road cuts. They thrive in the brightly lit areas stripped of the thin topsoil. They thrive in the brightly lit areas stripped of the thin topsoil making up for the nutrient deficiencies with the insets that they digest. Britton Riehm negotiating dense vegetation below Sinhagala peak. Three hours after starting out the Sinhagala path left the old logging road trail and took us over several hillocks before following a boulder-strewn stream upwards. The dense forest make locating ourselves in the landscape impossible though we knew that we were at the base of Sinhagala. Moss-covered rocks in the stream slowed us down. In the last stretch the pathway followed a steep incline amongst the drooping lianas and buttresses of enormous forest giants. Granite boulders covered in gray-green lichens provided small sheltered spaces-perhaps more often used by leopards than humans in this very far away corner of Sri Lanka. And then the pathway abruptly passed though a break in vegetation and opened up over a cliff face. 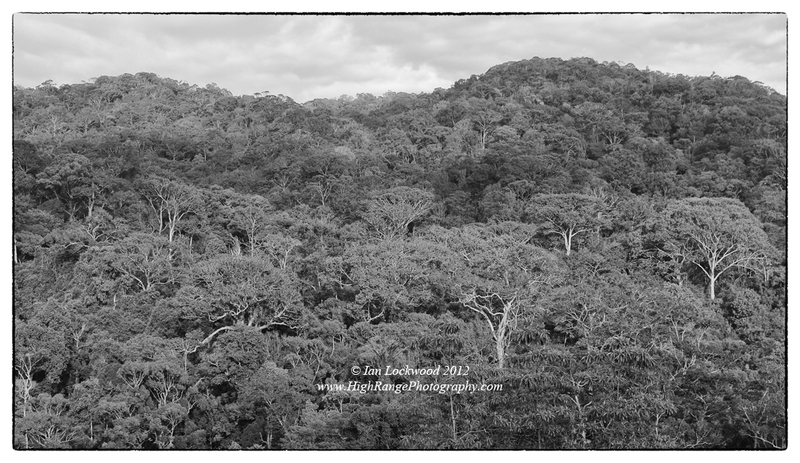 Through the break we were treated to a stunning panoramic view over the forest tracts of central Sinharaja. Below the cliffs was a scene of multiple valleys of rainforest canopy, sheltered by the rugged cliffs and hills that made up the range. To the East were the higher mist-shrouded ranges where we would go later that night. It wasn’t all unblemished landscape and in the distance were the clearcut slopes of land to be planted with tea. There were also the ubiquitous cell phone towers on the summits of several distant ranges to the south. This was our half way point and we breathed in the view while we waited for Krishan’s group to join us. 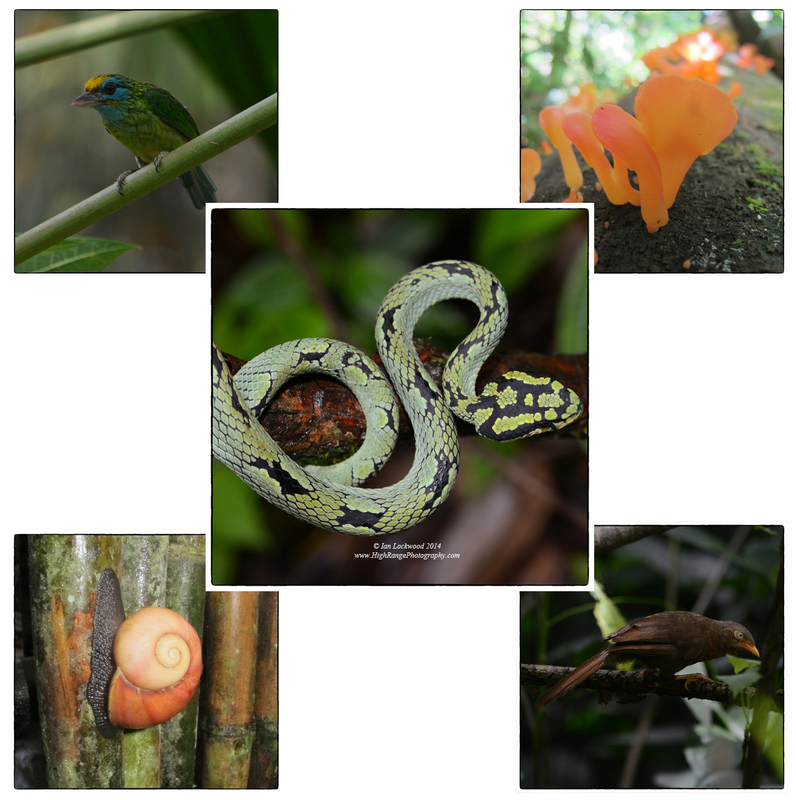 Collage of views from Sinhgala , the Sinhagala trail and a Sri Lanka Green Pit Viper (Trimeresurus trigonocephalus). 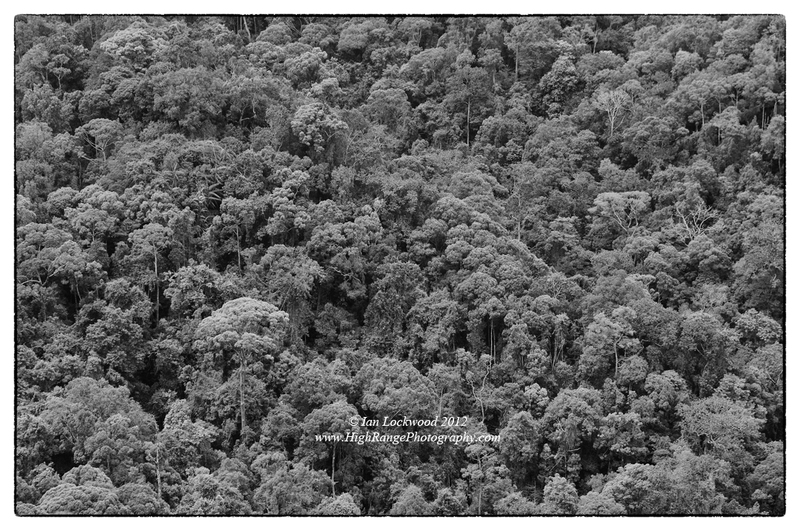 Rainforest canopy as seen from Sinhagala peak. Forest crown near the end of the trail above Pitadeniya (@ 300 meters). 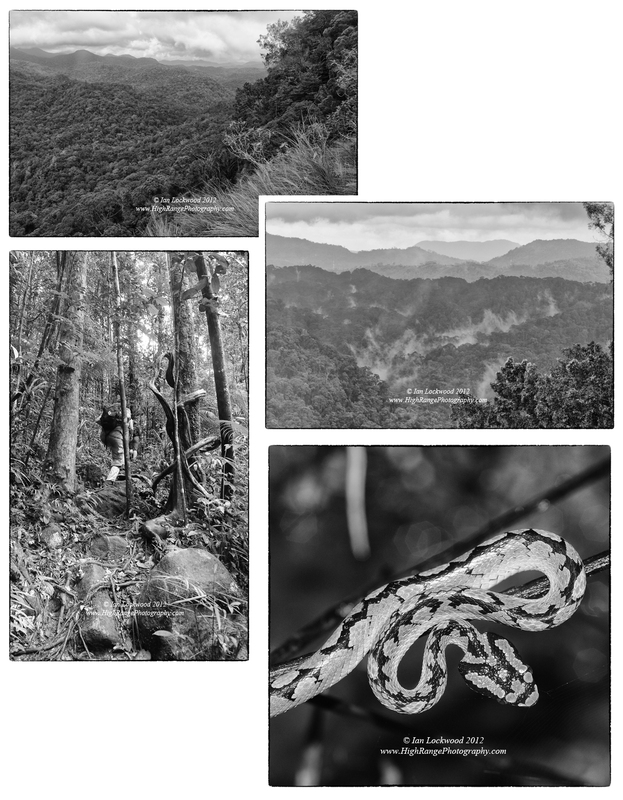 Series of images of species encountered on the Sinhagala traverse. The endemic Hump Nosed Lizard (Lyriocephalus scutatus) both female (left) and male (right) and Sri Lanka Blue Magpie (Urocissa ornata) at center. In the corners are two still-to-be identified damselflies. Krishan, his wife Indrika (who works with us at OSC), their two enthusiastic children and several others arrived on Sinhagala around 2:00. They were exhausted and drenched in sweat having just taken a very steep, overgrown trail up to the peak. Because of the hour there was little time for rest and we soon got going to descend on the trail that they had just spent so many hours climbing up. On the map it looked like a short distance but it ended up being a significant hike to get out. Krishan’s group had two guides and they were accompanied by Dulan Vidanapathirana who is a reptiles expert helping out at the Rainforest Ecolodge. We set a good pace but with the impending darkness there was little time to appreciate the forest and it denizens. When we finally emerged at the Pitadeniya entrance it was dark and we were worn out in that most positively fulfilled way! It was another two-hour, zig-zagged drive up to the Rainforest Ecolodge where we spent a night and morning recovering in comfort. I awoke to a flock of Blue Magpies- the signature endemic bird of Sinharaja- making a racket right outside my capsule-room. Soon after I accompanied Dulan on a short walk before breakfast- enough time to take in the magnificent forest and learn about the areas geckos, frogs and shield tails. Unfortunately we had to get back and left before lunch to return to our jobs, demands and lives in Colombo. The traverse from Kudawa to Pitadeniya was unforgettable and it helped me plan for the upcoming trip in January. I will modify the challenge and take our students in smaller segments, allowing for a deeper appreciation of Sinharaja’s landscape and ecology. Rainforest crown in Sinharaja East at 1,000 meters. Here the structure and composition of species is quite different from the lower forests at Kudawa and Petadeniya.